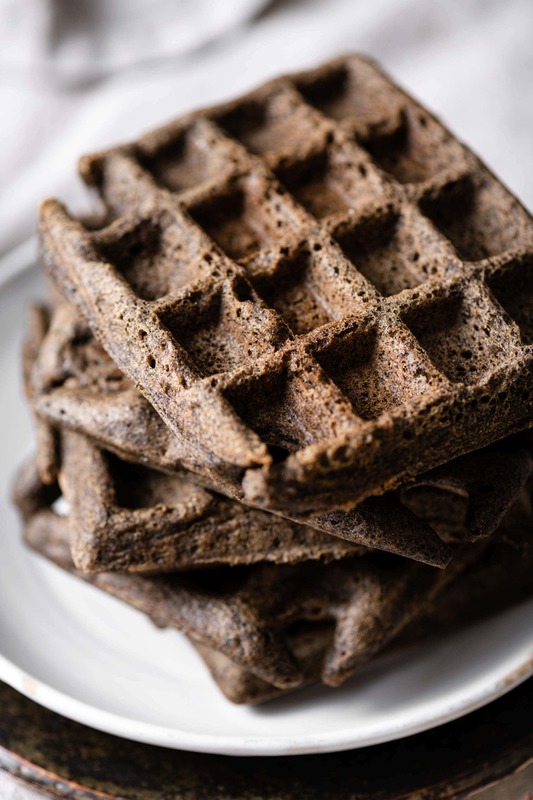 Gluten Free Buckwheat Waffles are full of flavor and my new favorite waffle style! 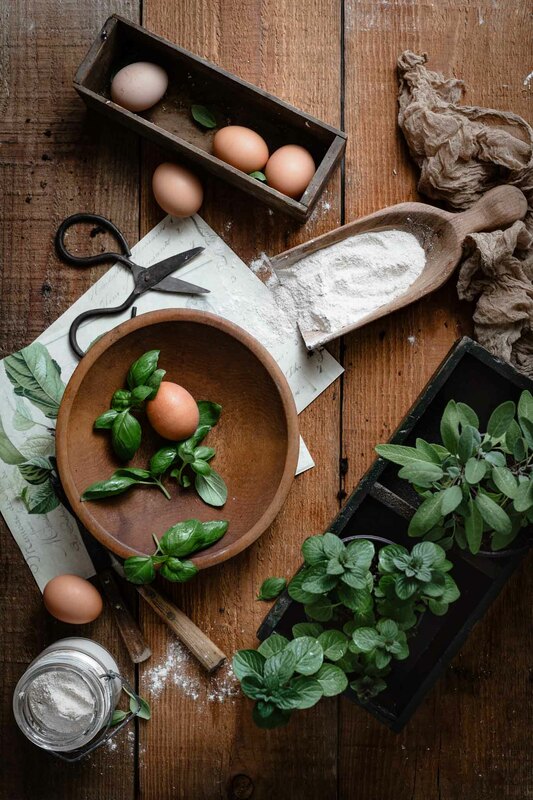 The aroma they give off while baking is so enticing, reminding me of all things cozy and comforting about breakfast. I’ve added nutmeg to the cinnamon for a touch of autumn spice. Topped with sweet cherries, then a pour, not a drizzle of amber maple syrup for a perfect waffle experience! Want a hint of cocoa in your waffles? 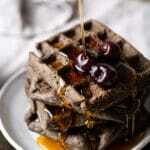 Substitute a 1/4 cup of buckwheat flour for cocoa powder and enjoy a Chocolate Buckwheat Waffle stack!! Add in 1 tsp of vanilla for another flavor adjustment. Batter should be easy to pour but not runny. 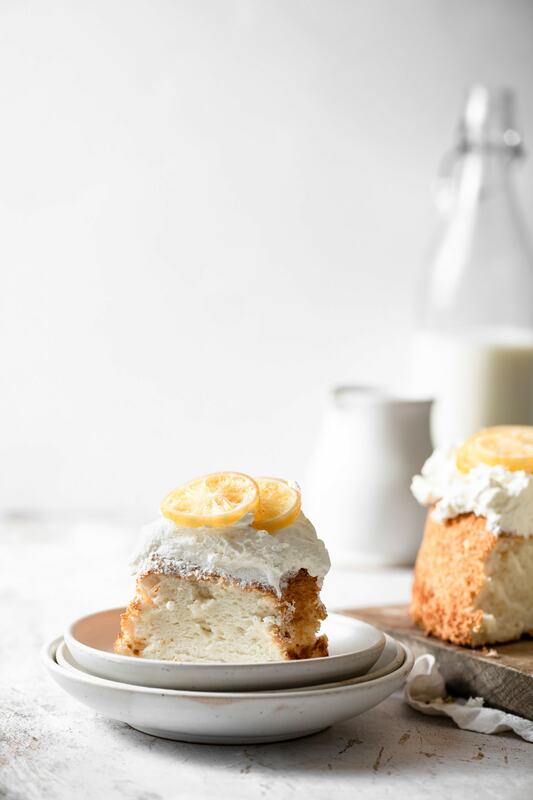 Buttermilk can be used instead of Almond Milk, but then you will need 1 cup of buckwheat flour to keep the mixture from being to thick. To freeze waffles for later: Place them side by side on a parchment paper lined baking tray in the freezer(~2 hrs). Once they have frozen wrap individually in freezer wrap and store for up to 3 months. To reheat simply microwave or pop in the toaster!! 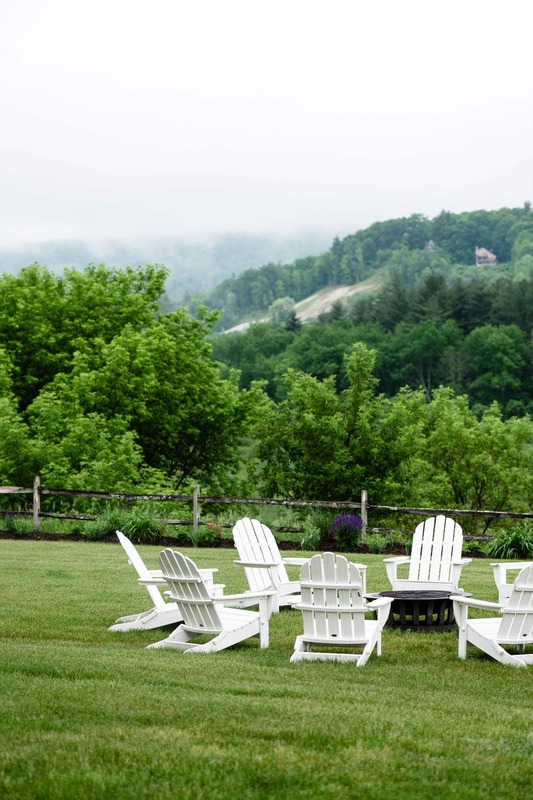 Buckwheat Flour is ground buckwheat, a fruit that closely resembles wild rhubarb. It is not categorized as a grain, but as a pseudo cereal. A Gluten Free flour with high quality proteins rich in magnesium, copper, and fiber. Buckwheat can give off a bitter flavor, so its best to add spices or mix as a ratio of buckwheat and wheat flours. Other Waffle Recipes to try are Rosemary Cheddar and Vegan Peanut Butter!! 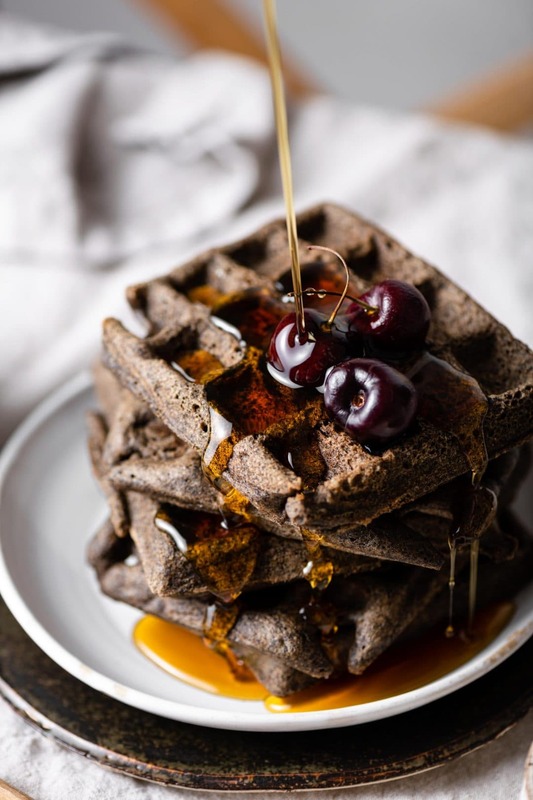 Check out this Chocolate Buckwheat Waffle Recipe from Bon Appetit! 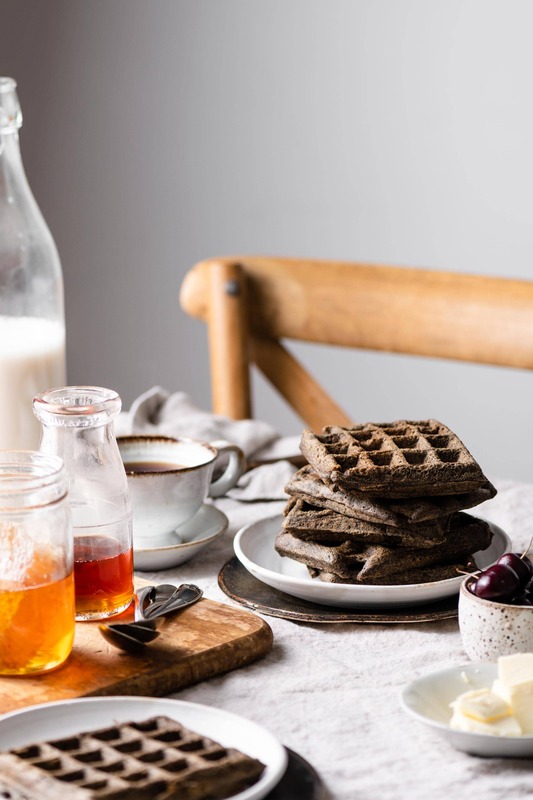 Buckwheat Waffles with with cinnamon and nutmeg! 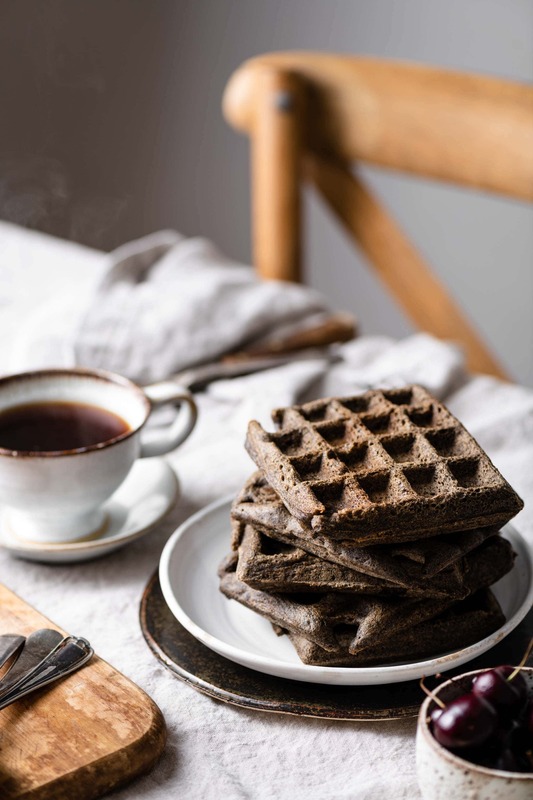 Fluffy aromatic Gluten Free Waffles plain or add cocoa for chocolate waffles! Combine all DRY ingredients into a medium bowl and whisk together. In a separate small bowl combine all LIQUID ingredients and whish together. Pour the wet ingredients into the dry and stir with spoon. Let batter sit for 3-5 minutes to amplify flavor. Spray waffle iron with non-stick coconut spray. Ladle batter onto waffle iron and cook for 8 minutes or until done. Serve with fresh cherries and maple syrup!